Kverneland 4324 LR - 4328 LT - 4332 LT - 4332 LR - 4336 LT - 4336 LR, Trailed mower conditioner with left hand drawbar and steel tine or roller conditioning. Working widths of 2.40, 2.81, 3.16 and 3.57m. 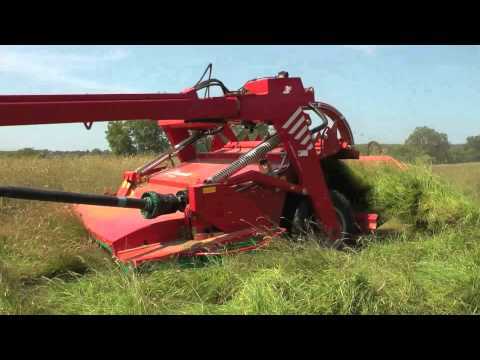 Including features such as SemiSwing conditioner, low maintenance cutterbar, SuperFloat suspension, BX Auto-Swather belt and FlipOver widespreading, Kverneland 4300 series machines are ready to meet every request with exceptional performance. SemiSwing steel tine conditioning or chevron rubber rollers. Available with BX Swath belt or FlipOver wide spreading kit.